I don’t know where baked potato salad has been all of my life, but I sure have been missing out. I think I’ve had it from the grocery store before, but I was not that impressed. Last week I ran across this recipe, and thought it was worth giving another chance. It tasted nothing like the baked potato salad I had bought at the store, and it tasted simply amazing. I will definitely be making it again. I can’t wait to take it to our next family get together. Wash the red potatoes and chop them into 1-inch cubes. You can peel the potatoes if you like, but since this recipe calls for red potatoes I decided to leave the peels on, and the salad turned out great, peels and all. Note: You can substitute regular potatoes for the red potatoes. Place the cubed potatoes into a large pot of boiling water and cook until potatoes are fork tender, about 15-20 minutes. Drain the potatoes. While the potatoes are cooling, chop the bacon into small pieces and fry it. Place the fried bacon on a paper towel to drain off the extra fat. 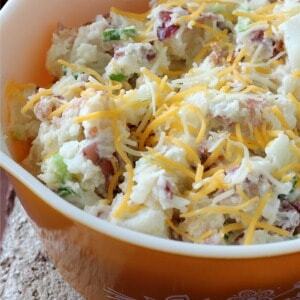 Stir together the cooled potatoes, bacon, mayonnaise, sour cream, grated cheese, green onions, and salt and pepper to taste. 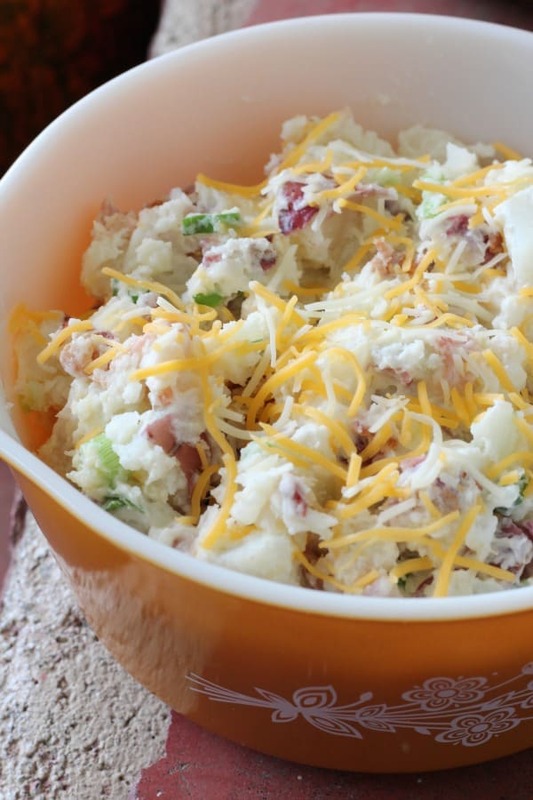 This baked potato salad tastes fabulous warm, or you can refrigerate it for later and serve it cold. When I am making potato salads like this one I rarely measure my ingredients. If you want to add more or less green onions, bacon, cheese, or whatever, feel free to alter the recipe to suit your tastes. Enjoy! Like this recipe? You might also like my recipe for making baked potatoes for a crowd.